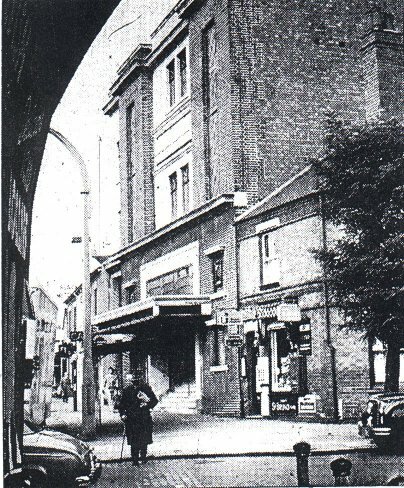 Just wanted to add that the buildings on the left have been knocked down to make way for the building of the Plaza cinema of which few decent pictures remain. I think one more house is yet to be demolished leaving just the shop at the far end on the corner? Just out-of-sight to the right on the corner of Melbourne Road was the Nag's Head itself knocked-down circa 1962 to be replaced by M&B wine merchants and is now the site of a plumbing showroom. This view is from just in front of the Black Horse on the opposite side of the road: Nag's Head Inn undergoing an extension. My memory box has just been shaken into action when Dutchman produced the arches photo. My friend and I used to walk home from the Plaza through Chain Gardens. How eerie that was as it was always so dark but we used to sing most of the way till we reached the Holyhead Road and civilization! If my memory serves me correctly was that along Four Pounds Avenue? Dreamtime said: If my memory serves me correctly was that along Four Pounds Avenue? Yes. Few people realise it but the path is still open and just as dark. I sometimes use it as a shortcut between Morrisons and Spon End. Whereabouts is that Dutchman - sounds like an interesting walk? Through the back of the old Renold Chain? Yes, you just keep on walking between the arches and the Renold until you reach the allotments. The path exits just behind B&Q where a short service road leads to Four Pounds Avenue. At this time of year though you will need waterproof boots as the path becomes very muddy. I also advise against using it at night as there is no lighting of any kind. I rediscovered the path by using the giant map at Coventry Walks. The same website has a wealth of historical detail such as the location of ancient tramways and waterways. Now that I've found this wealth of information on this forum, I'm here again, and probably one for the dutchman. My grandad was living at 10 Black Horse Yard in 1926 when he got married; am I right in thinking that there were houses to the rear of the Black Horse pub at that time? He worked at the Alvis which I imagine was then only at the back of him? Also, my maternal grandad married the Postmaster's daughter in 1909, the Post Office being in the Butts. Would anyone know whereabouts this Post Office was? Jonesyboy said: Now that I've found this wealth of information on this forum, I'm here again, and probably one for the dutchman. 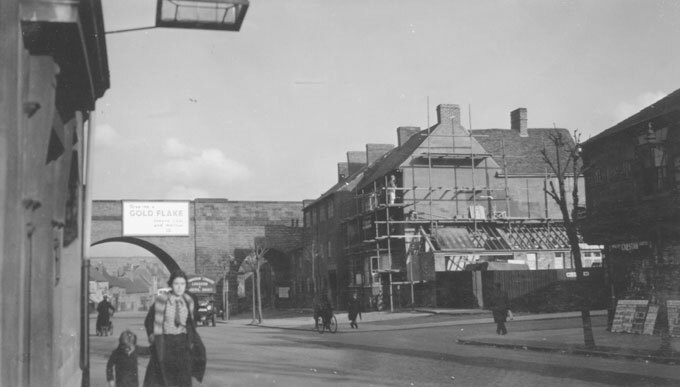 My grandad was living at 10 Black Horse Yard in 1926 when he got married; am I right in thinking that there were houses to the rear of the Black Horse pub at that time? Yes. Court No 7 contained many buildings including at least eight dwellings of which five constituted a row of substantial buildings with a communal garden which backed onto the river. These ran parallel to the main road with access from the large gap between the Black Horse and a neighbouring property. I suspect they were watchmakers houses. It would have been quite a roundabout walk to the Alvis though as the more direct route was blocked by the river. Jonesyboy said: Also, my maternal grandad married the Postmaster's daughter in 1909, the Post Office being in the Butts. Would anyone know whereabouts this Post Office was? Hard to say. Sub Post Offices moved from one place to another quite often during the 20th century so what might be the right location for one year could be wrong for another year. In the 1960s there was a Post Office at No 13 midway between the junctions of Upper York Street and Gordon Street opposite what is now the Ramada multi-story car park. In 1909 there was definitely a Post Office on the corner of Spon End Lane at the junction of Spon Street and The Butts road. Grateful thanks for your information! There is (or was) a public footpath from the Renold Chain factory across Chain Gardens and running between the Alvis and the sports ground. Chain Gardens were probably not there in 1909, but the footpath may have been. In those days, it may have entailed fording the Sherbourne, or at least crossing on stepping stones. Stepping Stones Road is nearby. There may even have been a plank bridge, the Sherbourne is not very wide at this point. The other way round would have been via Spon Street, Windsor Street and Holyhead Road, which is not much more tha half a mile (I used to walk from the Technical College to Coundon Road when I was eight to connect between buses on the way to school). peterw said: Spon end Arches - who remembers the time when a STEAM LOCOMOTIVE was shunting above in the goods yard and it went through a stop block and ended up down the bank at the side of the Arches coupled to a guards brakevan ? It was a Class 8F 2-8-0 tender loco which over-ran and came down the embankment. What a fabulous set of pictures. It was a sad event, as I believe that the fireman was fatally injured, but I may be wrong. Thank you so much for those pics. Hi all. 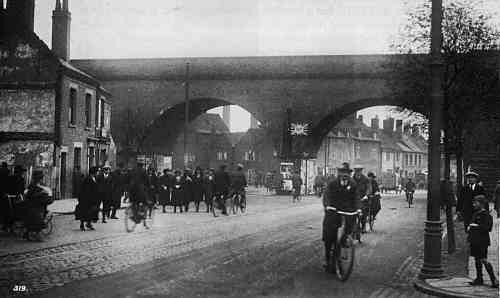 I came across this photo of the flats and Ringway Rudge. I wonder when this was photo was taken. It was give to me, a long time ago.